Please click here for further details! Thank you for your support! Chabad of Beijing has now completed our tax deductible account. All donations made by check to " AFJCB" or "American Friends Jewish Community Beijing" are tax deductible. Please see details below for sending your contribution. Once again we thank you for your support and generosity! students, backpackers, and young adults in Beijing. Jewish students, backpackers, and young adults in Beijing. If you choose to sponsor a Shabbat Experience, your sponsorship will be acknowledged in our weekly e-mail newsletter that is sent to over 1000 addresses. PLEASE NOTE: YOUR CREDIT CARD STATEMENT WILL APPEAR AS "AFJCB"
for the next twelve months. Chabad Lubavitch worldwide is dedicated to serving all Jews with Ahavat Yisrael regardless of religious background or affiliation. 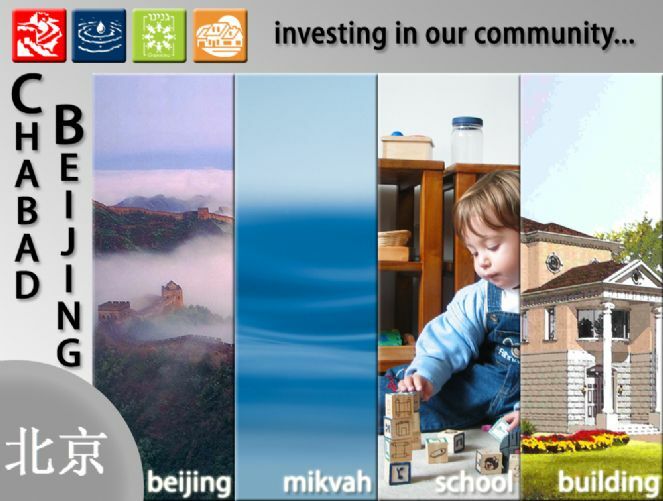 Chabad Beijing provides the education and means to promote Jewish awareness, knowledge and practice through outreach, education and social services ensuring Jewish continuity. Chabad encourages positive action on the part of every Jew and facilitates the efforts of every organization or group to increase Jewish knowledge and observance. Chabad Beijing is part of the worldwide Chabad Lubavitch Movement which has branches in every major Jewish city. Each location is funded individually from its own fundraising campaigns and the charitable donations of individuals. Your support enables us to continue our vital work, reaching the hundreds of Jews who live in Beijing and the thousands of backpackers, tourists and businesspeople who visit each year. Chabad Beijing is a non-profit organization. All donations are charitable contributions. Please let us know if you require a U.S. tax deductible receipt. Thank you for you Support. Checks will be deposited in a bank account for Chabad Beijing and are tax deductible. fax us at (8610) 6468 1322 to let us know the amount that you have sent and the date you sent it so that we may acknowledge your contribution. To view our online fundraising presentation, please click here.